We play a key role in transporting of over dimensional cargos (ODC) from Chennai, Krishnapatnam, Kakinada and Visakhapatnam ports by road all over India. Our ODC division is one of the core areas of specialization service at HTPL. 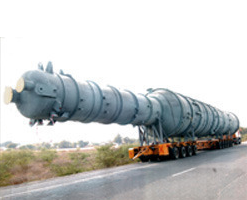 We can provide customized service as per clients requirement because we have experience, infrastructure, vehicles, equipment and manpower for timely and safely handling of over dimensional cargo. Studying the nature of cargo which to be transported. Selection of suitable vehicle and equipment for transportation. Route survey and then selection of most feasible route in terms of safety, time, and economic. We keep monitoring the transit to ensure safe and timely delivery.